The mark of a really good book is when you can’t wait to keep reading it, but when it’s finished, you feel a large hole in your life. This was how I felt about The Way of Kings, the first book in The Stormlight Archives. 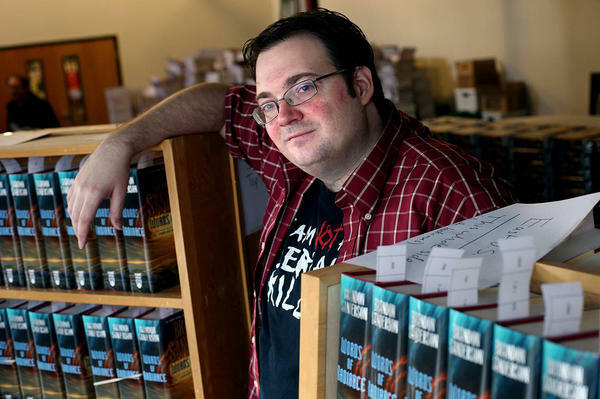 With the second book, Words of Radiance, the author’s first solo book to hit number one on the New York Times Bestseller list, it was 100 times worse. I don’t usually like reading thick books, and given Words of Radiance’s 1000+ pages, this was a big achievement for me. I am also the world’s slowest reader – yes, I actually pause when I see an ellipses on a page, even if I’m just reading to myself (you can argue that I’m a weirdo, I don’t mind – but I figure the writer included it for a reason!). Working my way through chores and other commitments as quickly as humanly possible, I longed to cuddle up on the couch to finish the book. The closer I got to the finish, however, the more stressed I became. It was going to be over too soon. Sanderson is hoping to have the next book published in 2016, but that’s too far away! Until recently, I wasn’t a huge fan of fantasy books. Honestly, I’d not read terribly many, but was put off by Tolkein at a young age (yes, I’m sorry, I’m one of those… I think both The Hobbit and The Lord of the Rings are just plain awful). But The Stormlight Archives stay well away from many fantasy tropes and typical creatures (i.e. wizards or elves or dwarves, etc), and instead, the creatures and the magic we do encounter make it feel far more like a fascinating science fiction tale. We pick up immediately where The Way of Kings left off… The highprinces are still settled on the Shattered Plains under the pretense of avenging King Gavilar’s murder by the mysterious Assassin in White. Kaladin and the bridgemen have been set free, Dalinar having effectively ‘bought’ them by giving up his shardblade to the traitor Sadeas. The members of bridge four try to deal with their new-found respect, fitting in amongst the lighteyes and being exposed to better training (even getting to ride horses!). Will they be able to get past their hatred of the lighteyes and perform their duties effectively? Shallan and Jasnah are making their way to the Shattered Plains to further their studies on the ancient city, Urithiru. When their ship goes down, Shallan is forced to make her way there on her own. Using her abilities, with the help of the newly-bonded spren she has attracted, she manages to convince thieves, slavers, con-artists, deserters, and merchants to help her on her journey. But will she get there in time to save the army from what’s coming? 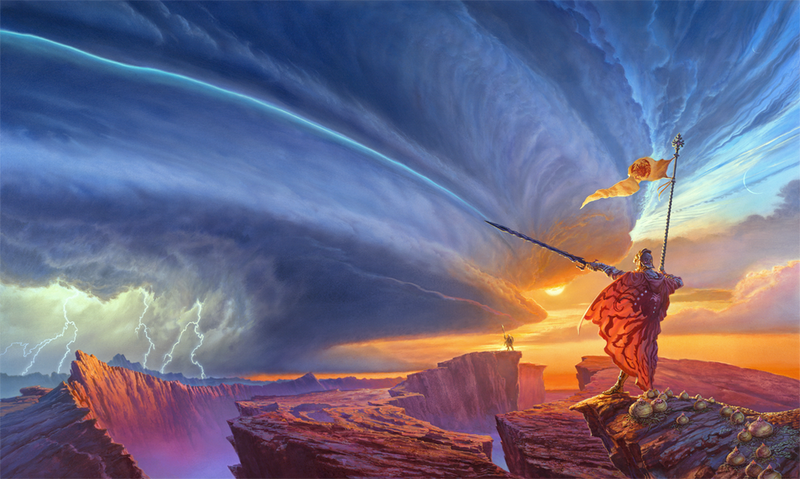 There is a beautiful richness to the world that Sanderson has developed for The Stormlight Archive series of books. Without relying on usual settings, species, or magics, he manages to create something truly unique. While it could be said that the books are of a typical era for fantasy books – there isn’t electricity or the internet, for instance, carriages are pulled by animals and they have to have scribes write down speeches – the magic system (via fabrials) is usable by many people within the society, making it possible for their civilization to advance a great deal. The world is also steeped in its own history. Many fantasy books feel like they exist in a land/kingdom/world that has kind of popped out of nowhere, with very little history to the land (or only in a very shallow way – for instance, Dwarves take back their old homeland in The Hobbit). 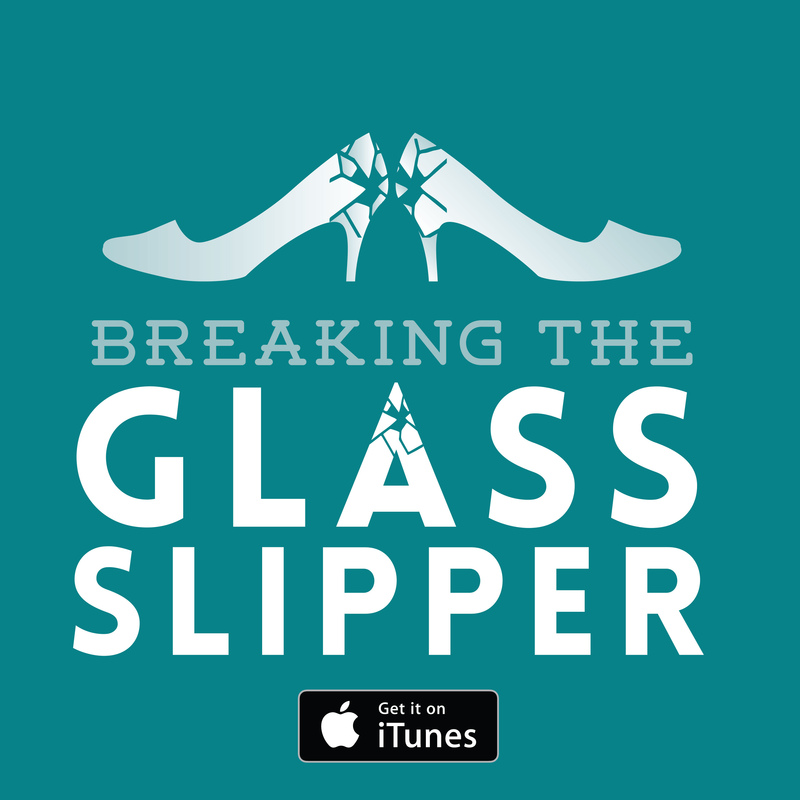 The history – and previously presumed myths – are all integral to the plot. Politics from thousands of years ago are still impacting the world’s shape. 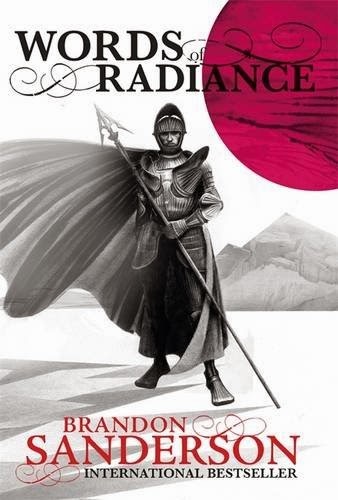 Sanderson looks at the way history repeats itself quite explicitly through the use of the Knights Radiant – while also reminding us that people will always believe that they can change the past (although they are often proven wrong). You might worry that building an entirely new world from scratch, without relying on well-known fantasy ideas, would be too tedious to get into. But fear not! Despite all the different names for things, different species, places, magics, etc, the books are very easy to follow. You are given enough of a hint about everything to get a clear picture in your head while acknowledging that sometimes it can be hard to keep all these weird words straight. If I can follow it, so can you, so don’t worry. 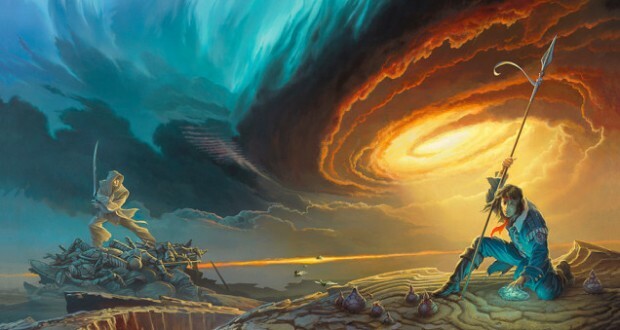 One problem that I do have with a lot of epic fantasy – actually, of any novels with a very wide cast of important characters – is the constant changing of viewpoints. On the one hand, this is great to ensure that you get to know these characters better than you would through only one gaze, but at the same time, it can sometimes slow down the story. You want to know what is going to happen next but then the chapter ends! And the next chapter is dealing with a different set of characters! No! No! No! This tantrum throwing two year old has had enough of this! For the majority of the book (and boy, there’s a lot of this beast! ), Sanderson is good at keeping the momentum going – he only switches focal points where necessary. Actually, when it comes to sections of very fast-paced action, you might get several viewpoints in the same chapter. However, between the main ‘parts’ of the novel, he includes ‘interludes’. These drive me a little bonkers sometimes. I agree, it is probably a great way to introduce characters that might be important later on – or to simply provide us a little bit more insight into otherwise supporting characters. Having said that, you get halfway through a behemoth of a book like this and then suddenly have to switch your brain around to try and care about these new characters you know nothing about. Sometimes it works, sometimes it doesn’t. Giving us an insight into the Parshendi is really fascinating – but I could probably have done with leaving the focus here for all the interludes. The only other Interludes I felt were truly worth including were those of King Taravagnian (in order to set-up a conspiracy that will presumably be very important in the next book) and the final interlude from Wit’s perspective – giving us a bit of a bombshell as the final curtain call arrives. For those of you philosophy nerds out there – come on, there must be some of you, surely I’m not the only one – there’s a lovely reference to Nietzsche throughout Words of Radiance. Their god is dead. The spren, who aren’t actually gods but are close to it in conception, were betrayed in the past and killed by humans they bonded with. These deaths occur when the humans forget their promises, going against the moral code the spren adhere to. Throughout the novel there are some interesting questions regarding religion. Personally, I found it quite critical of everything to do with religion. Suggesting that everything people believed were part of a religion have another explanation. He also points to corruption within church bodies and people using religion as an excuse for terrible acts in very Machiavellian ways. However, Sanderson is actually a Mormon, so I’d hazard a guess that this was not his intended message. Nevertheless, this is what I took from it. I certainly saw some tendencies towards nihilism in the novel, with both Shallan and Kaladin asking whether anything they did really meant anything. Verdict: Do yourself a favour and read this series! Yes, the books area incredibly long, but they are well worth it! Science Fiction and Fantasy Worlds Shadows of Self by Brandon Sanderson: Stop talking to your hat and get over here. Lev Grossman’s The Magicians: He was used to this anticlimactic feeling Something Wicked This Way Comes: Don’t talk to death!